Heat a Dutch oven with the EVOO over medium-high heat. Add the bacon or pancetta and brown; remove and reserve on a paper towel-lined plate. Pat the short ribs dry and season liberally with salt and pepper. Brown the meat evenly in the drippings and remove. Add the vegetables and garlic and stir for 5 minutes. Season with salt, pepper and fennel, then add the bay leaf, stir in the tomato paste and cook for 1 minute. Add the herb bundle and deglaze the pan with the wine. Stir; add the consommé and stock. Add the beef and bacon back into pan and cover; roast for 2 1/2 hours, to tender. Bring a pot of water to a boil, salt it and cook the pasta for 5 minutes; drain. Remove the meat and herb bundle. Cover the meat to keep warm. Add the pasta and beans to the pan and stir in half the cheeses. Set the beef into the pasta and cover with the remaining cheese. Brown in the center of the oven, under the broiler. In Recipes-list.com we have selected the most viewed recipes from category - uncategorized . Enjoy the best recipes specially selected for you! 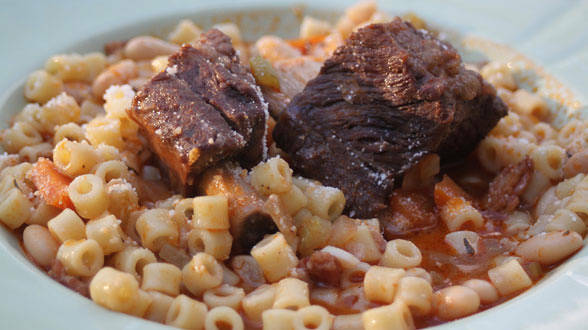 Short Ribs with Pasta e Fagioli is the right choice that will satisfy all your claims.